Indonesian Nasi Padang at Warung Ita in Lakemba. Bagus. We get off the train and realise that neither of us have ever been to Lakemba, and Alison is Sydney born and bred. There's so much good food here folks: there's a zillion Lebanese bakeries, cafe\restaurants and sweets shops; as well as Turkish, Indonesian, Indian, Pakastani, Halal Chinese, Thai and even a Christmas\Cocos Islands restaurant (oh how we miss Island Dreams when it was in Thainatown!). Deciding where to eat would be difficult had we not already had a place in mind, Warung Ita. We have a penchant for Nasi Padang, the pick'n'mix spicy cuisine from Sumatra in Northern Indonesia. Inside Warung Ita is authentically basic: formica tables, white tiles, prawn crackers and help-your-self drinks and cutlery. While the decor may not be special, the boss lady is something else. This lovely auntie is the most enthusiastic restaurant lady we have come across, she is all jokes and smiles and makes us feel instantly at home and happy on a dull grey cold day. The sounds of chatter and laughing in this little place transport us to Indonesia again, just for a little while, can't ask for more than that. There's no menu, just point to you what you want in the bainmarie, that's the way it's done in Indonesia. Three choices with rice is $9.50. Bargain. Alison chose the fish, tempe with fried potato, beef rendang, and ikan bilis (peanuts with dried anchovies). The fish isn't overly 'fishy' as it sometimes can be, which suits our Western palates; the rendang is good; and tempe always tastes better when someone else cooks it. Shawn opts for eggplant, chicken, and fried potato. The eggplant is divine, not overly oily and not overpowered by sauce, you can taste eggplant, it's perfect. The chicken is great and the fried potatos are like spicy, super crunchy Kettle Crisps. Yum. The pastry was $1.50 and was very much like a veggie Cornish pastie. We're not sure what this is called but Shawn has had it in Indonesia before and had a little trip down memory lane. A special mention has to go to the sambal: it's super fresh but not super hot, nice and mild and easy to eat. We couldn't resist sweeties: Kue Lapis - $3. The smell of pandan\coconut blew us away when we opened the lid. These are sweet, gelatinous and filling. Indonesian pancakes - thick and hearty - $3.50. Three-and-a-bit choices on rice: fried potato and tempeh and a tender wet beef rendang. Plus a spoon of the crunchy peanut and anchovies is essential. 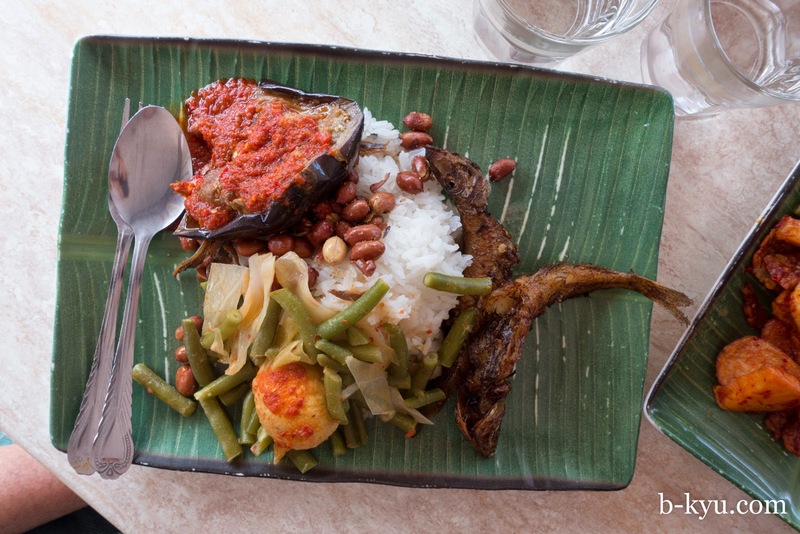 Eggplant, fried fish, more beans and eggplant with sambal. Warung Ita is right up there with our other nasi Padang favourite, Pondok Buyong in Kensington, highly recommended. These places are best visited around lunchtime or earlier when the food is freshest and most plentiful. Shop 1 168-172 Haldon Street, Lakemba. Phone 9740 5527. Open every day 10am to 6pm. Mmmm, Indonesian in Lakemba .... sounds all right and I might give it a go next time I'm near. 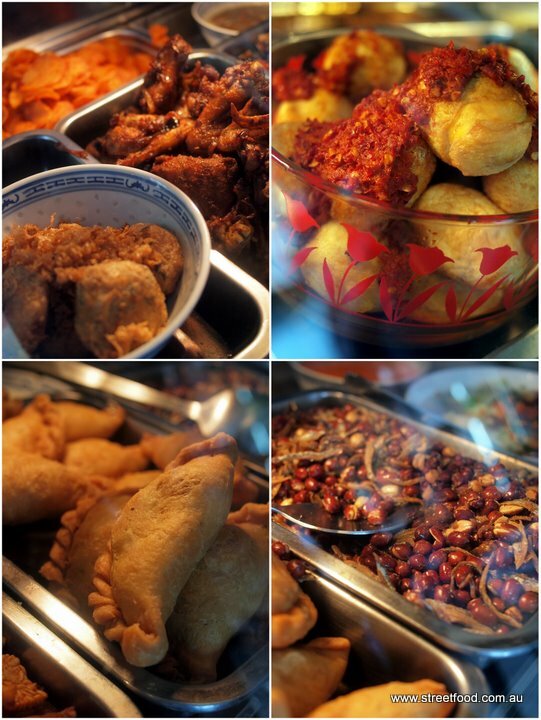 The pastry called Pastel.A very popular Indonesian savoury snack. It similar like Malay/Thai curry puff but no curry flavour in Indonesian pastel. I love Lakemba. Such a thriving suburb of delicious eats. Have yet to make it to Warung Ita although I've walked past it a couple of times. Looks great! I have been to Lakemba a few times but never noticed this place. I am always in lebanese food mindset! This place looks really good though. That looks amazing. 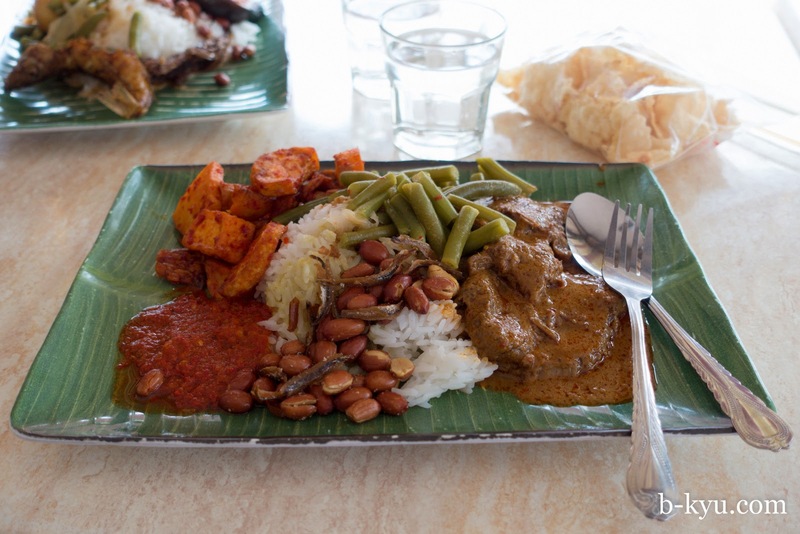 I've been missing masakan Padang since I moved back to Aus and this looks like it could hit the spot. Love love love their banana leaf rice pockets! Plus they are just about the friendliest, most kind and helpful people you could ever meet! Don't just want to wrap them up those aunties and take them home?